In the now-familiar story of the “Good Samaritan” we see that even those who are attempting to be faithful to God in their religious duties can miss a need nearby. Like the Priest and Levite, it’s easy to “look straight ahead” and keep on going with our lives. Jesus calls us to “look to the side” to see our neighbor in need. That’s what the Samaritan did. That’s what we want to do – to BE a neighbor to those affected by the Superstorm. The Rockaway area of Queens, NY was one of the hardest hit by Sandy, devastating entire neighborhoods. Some who live in the Rockaways have been among the last to receive electrical power or outside assistance. 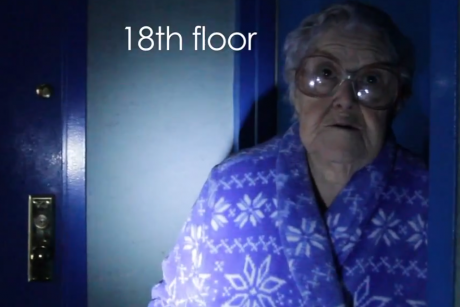 Many, like this woman, were stranded for days in cold, dark high rises. In order to “look to the side” and be a neighbor we are loading a semi-trailer with supplies which we will take to the relief centers in the Rockaways. There is currently NO NEED for food for this drop as FEMA is supplying all of their food needs. WHERE: The large semi-trailer truck in the parking lot, visible from Mountain Road. WHO: All of us. Encourage your friends, family, workmates, and neighbors to participate. The need is real. The connection will be made – the things you donate will get into the hands and homes that need them. We need help staffing the trailer during ALL OF THESE times. If you can help receive items, stack them in the truck and be of help during any of our collection times, please send an email to Sandy@mountaincc.org telling your name and which time slots you could be available to help. For more information about Sandy Relief through Mountain, or to sign up for the Boots on the Ground trip to Union Beach, NJ on Monday, November 19, go to the Mountain Website to LEARN MORE.